PC version doesn't have any multiplayer modes. Original retail version requires a few fixes to work on modern Windows, see Issues fixed. Fixed crashing on launch on newer Windows versions. Includes dgVoodoo 2 to fix rendering glitches (requires GPU with DirectX 11 support). 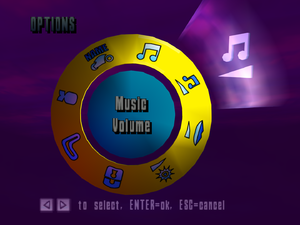 Includes launcher for changing game resolution, control presets and music tracks. 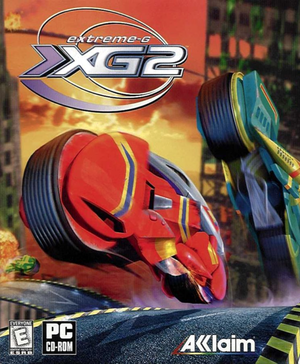 Includes music tracks from all games in the Extreme-G series. See Widescreen resolution. Camera position can be changed using in-game controls. Can be forced using dgVoodoo 2. The game is made for 4:3 aspect ratio and defaults to 640x480, it is stretched on widescreen resolutions by default. Visit the WSGF page, download the attachment and extract the files. Open the folder with the aspect ratio you wish to use, then copy xg2pc.exe to the game installation folder and replace the existing file. The executables in the attachment are based on the retail US version which was already hex edited to prevent crashing on Windows XP and later. These offsets and values are for the retail US version and were not tested on other versions. Open xg2pc.exe with a hex editor such as HxD. Floating Point to Hex Converter can be used to easily convert the values. Press Space in the bike selection screen to enter controls configuration menu. Triggers on XInput controllers are not recognized. Press Space in the bike selection screen to enter controls configuration menu (only buttons can be remapped). OutputDebugString calls cause the game to crash, removing the calls fixes the issue. Search for all instances of FF 15 E4 56 B1 01 and replace them with 90 90 90 90 90 90. On modern GPUs font and texture rendering is glitched. Copy the files from the MS folder and paste them into the game installation folder. Run dgVoodooCpl.exe and open the DirectX tab. Under Videocard select ATI Radeon 8500. Because of the way the game uses timers, the framerate will be very low if Windows has been running for more than three days. ↑ 2.0 2.1 File/folder structure within this directory reflects the path(s) listed for Windows and/or Steam game data (use Wine regedit to access Windows registry paths). Games with Steam Cloud support may store data in ~/.steam/steam/userdata/<user-id>/582260/ in addition to or instead of this directory. The app ID (582260) may differ in some cases. Treat backslashes as forward slashes. See the glossary page for details.